The UK currently has the world’s largest and oldest digital radio network, with 103 transmitters, with three national DAB ensembles and forty-eight local and regional DAB multiplexes broadcasting over 250 commercial and 34 BBC radio stations across the UK. In the capital of London, there are already more than 51 different digital stations available. Digital radio multiplex operators and stations need a broadcasting licence from the UK’s media regulator Ofcom to broadcast. Digital radio in the United Kingdom is being promoted by radio stations and the broadcasting industry on the premise that it provides a wider choice of radio stations, is easier to use, and is resistant to the interference which other broadcast media are susceptible to. However, the price paid for the extra number of stations is that the audio quality on DAB is lower than on FM. Also, some areas of the country are not presently covered by DAB; the BBC says that it may not provide coverage to the final 10% of the population, and may use Digital Radio Mondiale instead. In 2011, Ofcom published a consultation with the intent to push DAB coverage across the United Kingdom up to the same level as enjoyed by FM broadcasting in the United Kingdom. The United Kingdom Government intends to migrate the vast majority of AM and FM analogue services to digital between 2015 and 2019, subject to targets being met for coverage, listening figures for digital radio and agreements in relation to funding and other decisions related to switchover being made under a Memorandum of Understanding between the Department for Culture, Media and Sport, broadcasters and ensemble operators. The proportion of UK radio listeners with a DAB radio in their household was 49% in 2015 (Ofcom). The proportion of listener hours through a digital platform (DAB, online, DTV) was 40% in 2015 (Ofcom). More than 61 per cent of new cars now come with a DAB digital radio as standard. DAB radio uses a transmission system known as coded orthogonal frequency division multiplex (COFDM). This divides the signals amongst several hundred low bitrate carriers. Because the bitrates are low, the signal can be subject to large multipath dispersion without any adverse effect on reception. Multipath actually reinforces and improves reception. For DAB, the bitrates on the individual carriers are low enough for different transmitters carrying the same stations to broadcast on the same frequency, provided they are correctly synchronised. This enables much more efficient use of the radio spectrum. Each DAB transmission, known as a multiplex, is spread over about 1.5 MHz, with 4 phase (2 bit) symbols. This gives a data rate of about 2.4 Mbit/s, about half of which is used for error correction (though this may be varied). Each multiplex carries between 6 and 15 radio stations, depending on the bitrate allocated to each station. The data for all the stations is distributed amongst all of the carriers. This is to ensure that interference to a few carriers does not cause more disruption to a particular station’s bitstream than the error correction software can handle. Time interleaving is also used to protect against short duration interference spikes. 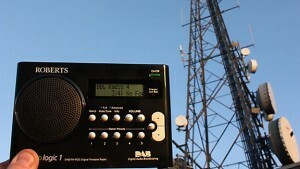 DAB broadcasts in VHF band III between 174 and 240 MHz. Band III is divided into eight 7 MHz channels, numbered 5 to 12 and the 10 MHz wide channel 13. Channels 1-4 are in band I, which is no longer used for broadcasting. letter. The BBC national multiplex uses channel 12B, Digital One on 11D and Sound Digital on 11A. DAB can also operate in the L band between 1452 and 1492 MHz. However, many DAB radios only receive VHF band III. For most listeners, the built-in aerial should be sufficient for reliable reception. For those outside the main urban areas, an external aerial may be required. In most areas, a Single Element Dipole Aerial should be sufficient to receive signals from multiple DAB transmitters. For weaker or fringe signal areas a DAB 3 Elements Aerial would be recommended. All DAB aerials mount on a vertical pole up to 3.81 cm (1.5 inches), they can be mounted internally usually in a loft or externally depending on the signal level and distance from the transmitter. When purchasing a new DAB radio make sure it is a DAB+ radio, three DAB+ stations will soon be on air and more are certain to follow in the future. DAB+ radios can also receive the older DAB format currently used in the UK. DAB provides low audio quality in the UK due to 98% of stereo stations using a bit rate level of 128 kbit/s with the MP2 audio codec, which provides much poorer sound quality than FM-quality. Also, a large and growing number of music stations are transmitting in mono. Indeed, the bitrates used by the radio stations on other digital platforms, such as cable, terrestrial and satellite are usually higher than on DAB, so the audio quality is also higher. For example, all of the BBC stations use higher bit rates on Freeview and satellite than on DAB, apart from the BBC World Service on Freeview. In addition, Ofcom has said that even after extra spectrum has been allocated to DAB, it estimates that around 90 local radio stations will either be unable to transmit on DAB because there is no space for them on a local DAB multiplex or because they cannot afford the high transmission costs of DAB that the multiplex operators are charging. 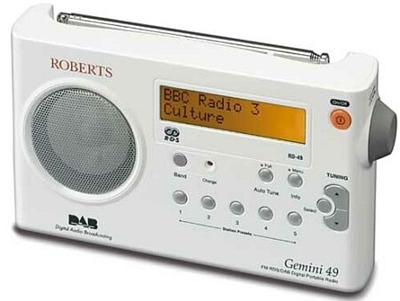 However, Ofcom announced in 2005 that it regarded Digital Radio Mondiale (DRM) as being an option for the local stations unable to secure carriage or unable to pay the high transmission costs of DAB. The current UK DAB system has a long list of drawbacks associated with it due to the fact that the system was designed 20 years ago and it uses technologies that are outdated and inefficient. Numerous countries that had previously supported DAB rejected using it because it is so outdated. DAB+ is an upgrade of the DAB system, which solves or vastly improves upon each of DAB’s drawbacks. The main advantage of DAB+ is that it is three times as efficient as DAB, which mean that DAB+ can carry far more stations, and all stations can be delivered at far higher audio quality than on DAB. Other benefits include transmission costs being far lower; less spectrum being required; reception quality is far more robust, and DAB+ is a much greener technology because the overall transmission power required is far lower. 98% of stereo stations on DAB in the UK are broadcast at lower audio quality than on FM. The main problem with DAB is an outdated system with quantity over quality is given preference, resulting in inferior sound quality due to very low bitrates. The situation is not likely to improve before any switch to the far more efficient DAB+ system. stations at similar quality too than on FM is if the stations switch to using DAB+. DAB+ prior to any FM transmissions ending. As the BBC’s stations account for such a large proportion of all radio listening, the following table shows the problems with the audio quality of the BBC’s stations on DAB. DAB+, a newer digital radio standard using the HE-AAC encoding standard and announced by the WorldDAB organisation in 2006, is being considered for digital radio broadcasting in the UK. HE-AAC encoding is more efficient than the MPEG-2 Layer II encoding standard currently used for DAB in the UK. DAB+ will either allow stations to broadcast at higher sound quality than currently possible with DAB, or allow more stations at the same quality currently broadcast on an ensemble. The Digital Radio Development Bureau released a press statement in January 2007 in which they admitted that DAB+ will be used in the UK in future. Ofcom has said that the UK will switch to DAB+, but not until the vast majority of radio sets can work with DAB+. If broadcasters and regulators dropped DAB in favour of DAB+ it is unlikely that current digital radio owners would be able to upgrade their model to receive the DAB+ signal. Any change to DAB+ would have to be gradual, allowing those with non-upgradable receivers to obtain new equipment. A number of stations are using DAB+ on the Sound Digital mux. DAB radio stations in the United Kingdom are broadcast on a number of frequency blocks on VHF Band III. The original plan devised in Wiesbaden for the framework of DAB in Europe was to allocate frequency blocks 11B to 12D for UK DAB broadcasting. However, as part of its Review of Radio, Ofcom has expanded the frequency allocations for DAB and has advertised local and a national ensemble licence on blocks outside the original Wiesbaden plan on 10B to 10D and 11A. Block 5A has also been reserved for the launch of local ensembles. BBC National DAB is a Digital audio broadcasting multiplex owned and operated by the BBC and is transmitted from a number of transmitter sites across the country; it only carries BBC radio stations. The BBC National DAB multiplex makes extensive use of dynamic ensemble reconfiguration to allow a number of part-time services to broadcast. While these additional services are on air the bit rates of (one or more of) BBC Radio 3, BBC Radio 4, BBC Radio 5, and data services are reduced. Digital radio text is the scrolling information that is broadcast along with the audio content on DAB. This can be dynamic programme information, an email address or phone number for a particular show, news headlines and sports results – and on some music networks ‘now playing’ track information. Some of the latest DAB products can pick up a broadcast EPG (Electronic Programme Guide) which provides free, useful information programme information for up to 7 days in advance prior to broadcast, allowing users to record a particular show automatically – or even an entire series of programmes. Digital One launched in November 1999 and has held a digital radio licence for national commercial radio in the UK ever since. It broadcasts a broad range of content including traffic data services and some of the UK’s most profitable radio stations. The company is wholly owned by Arqiva, one of the UK’s biggest communications infrastructure companies which operate across broadcast, satellite and mobile communications markets. Digital One’s head office is in central London alongside other Arqiva businesses. In 2011 Digital One’s licence was renewed for a further period which runs until November 2023. Sound Digital, the joint venture company formed by Arqiva, Bauer Media and UTV Media. The UK’s second national commercial DAB digital radio multiplex network will launch on Monday 29th February 2016. Three of them will be broadcasting in DAB+, Fun Kids, Jazz FM and a new service called Magic Chilled from Bauer. There is no information on the bitrates that will be used by the various stations at present. Test transmissions are currently taking place from some transmitter sites in the UK. There are two test services available: Sound Waves and Sound Waves+ (displayed as Waves / Waves+ on DAB sets with short displays). Try scanning VHF Block 11A to see if you are in range of the test transmissions. Note: until 15th February, the quality of what you receive, where you receive it and when you receive it may be dependent on the nature of the test transmissions. Some transmitter sites have recently gone into 24-hour testing, you will need a DAB+ radio to receive Sound Waves+ (28 kbp/s). Sound Waves+ is available in stereo on DAB+ sets compatible with HE-AAC v2. From 15th February 2016, regular test transmissions commence ahead of the official launch of services on 29th February. Can anyone confirm what bitrates are being used? Maps and coverage figures for the existing coverage of local DAB multiplexes can be found on the Ofcom website. Under a Framework Agreement signed in December 2014, Government, local radio multiplex operators and the BBC have agreed to improve the coverage of local DAB multiplexes around the UK. These multiplexes carry both commercial radio services and BBC local or nations’ services. Information about DAB transmissions around the world. Website of the national commercial digital radio operator, full of useful information about national DAB stations. A one-stop guide to DAB in the U.K., coverage, stations equipment and information on in car DAB. The Digital Radio Development Bureau (DRDB) is a trade body funded and supported by the BBC and commercial radio multiplex operators. There are over 60 DAB radio stations available in London. Some of these are digital broadcasts of local and national radio stations which are available via AM and FM radio, but there are also a large number of additional stations which aren’t available on analogue. This page contains a list of all the radio stations currently available on DAB in London. Operator of the second commercial DAB multiplex in the UK. Source of information on DAB around the world.